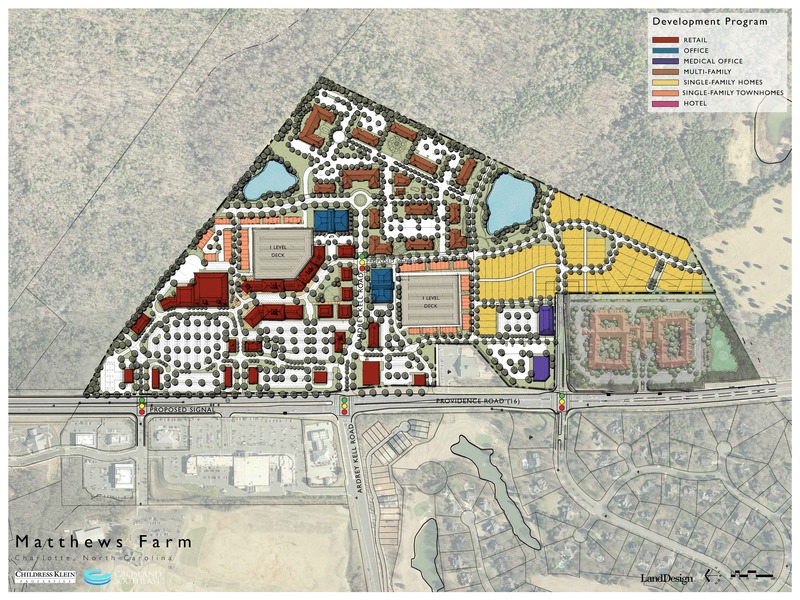 Charlotte, N.C., July 30, 2013 – Leading Charlotte based commercial developers Childress Klein Properties and Crosland Southeast announced that they have filed for the rezoning of a 90-acre former farm in South Charlotte. The site across from Rea Village at the intersection of Providence Road and Ardrey Kell Road will be the new home of a master planned, multi-use lifestyle development, yet to be named. The rezoning application has been filed with an anticipated public hearing in October. The land is one of the most desirable, undeveloped tracts in the affluent South Charlotte corridor. Known by its owners as The Matthews Family Farm, the property has been in the Matthews family since 1860, when it was gifted to Sarah Houston by her parents as a wedding present upon her marriage to William McGill Matthews. The vacant parcel is being rezoned for a $200 Million commercial and residential development, with plans to include Class A office space, retail, medical facilities, single-family homes, apartments and townhomes. Changes to the infrastructure will also include the continuation of Ardrey Kell Road and the addition of a traffic signal at Golf Links Drive and Providence Road, funded by the developers. The extension of Ardrey Kell Road will incorporate traffic calming measures such as parallel parking, medians and a traffic circle to ensure that it is pedestrian-friendly. Childress Klein and Crosland Southeast are responsible for some of the Charlotte area’s most successful mixed and multi-use developments including Blakeney, RiverGate, Birkdale Village and the Duke Energy Center. Both companies have been watching this land for years and were among a number of local and national developers who sought out the opportunity to develop it. Currently, the site is being master planned to include retail space ranging from 225,000-250,000 square feet, anchored by an upscale grocery store, with approximately 90,000 square feet of restaurant and shop space located on the main street surrounding a public plaza area with outdoor dining. The project will also incorporate two five to six-story Class A office buildings targeting mid-sized Fortune 1000 corporations, two two-story medical office buildings totaling 60,000 square feet and two wrapped one-level parking decks, similar to the decks at Birkdale Village. Approximately 180 single-family and townhomes are also being proposed along with 375 upscale multifamily apartment homes. The team is currently in negotiations with single-family and multi-family developers, and has begun meeting with neighbors. The rezoning application has been filed and a public hearing will take place in October. The city council vote will likely be in 2014. Crosland Southeast and its partners have a long history of developing and leasing award winning retail and mixed-use developments throughout seven southeastern states. The five Crosland Southeast partners previously served as officers of the 74-year old Crosland LLC, and have a combined 115 years experience in the shopping center industry. Today, Crosland Southeast perpetuates excellence with its emphasis on retail acquisitions, advisory services, single-tenant development and the development of high-quality retail and mixed-use properties which epitomize placemaking at its finest. During their careers, the executive team has developed more than 24 million square feet of projects. For more information, visit www.croslandsoutheast.com. Childress Klein Properties has been in business in the southeastern United States since 1988. Throughout Virginia, North and South Carolina, Georgia and Florida, the partners of Childress Klein Properties have been responsible for the development of over 40 million square feet of office, retail and industrial properties. The company is active in markets across the Southeast through offices in Charlotte and Atlanta. As one of the largest private real estate developers in the Southeast, Childress Klein Properties has experience in a wide range of projects – from small flex buildings to multi-million square foot distribution parks, from small, freestanding retail buildings to large, multi-phase lifestyle centers and from conveniently located suburban office buildings to 1 million+ square foot, high-rise urban office towers. With a portfolio in excess of 23 million square feet and more than $1 billion in assets, Childress Klein Properties has the resources to undertake any size project. For more information, please visit www.childressklein.com.